FA of exoskeletal material - It really is a crust secreted by the skin (a laminated crust that in most living arthropods is made up of three layers). 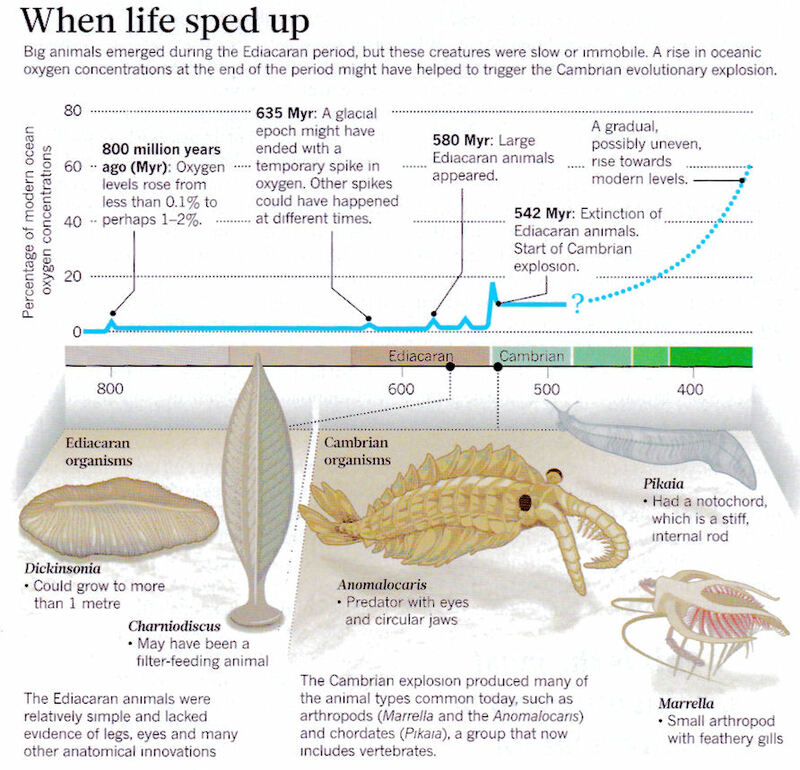 FA of many invertebrate phyla - Life took off in the Cambrian period (the Cambrian Explosion). By its end, all the main lines of animal types, whose descendants fill the world today, had been established. All of this diversity flourished in the sea; there was still no life on land. FA of vertebrates1 (jawless fish, ostracoderm also known as Agnatha) - Fish without jaws were the first vertebrates. Just like the molluscs and arthropods, the early fish had a hard outer covering. This armor plating around their front ends was made of bone. They had probably ate by sucking in mud through their mouths. They filtered out particles of food as the water left through their gills. 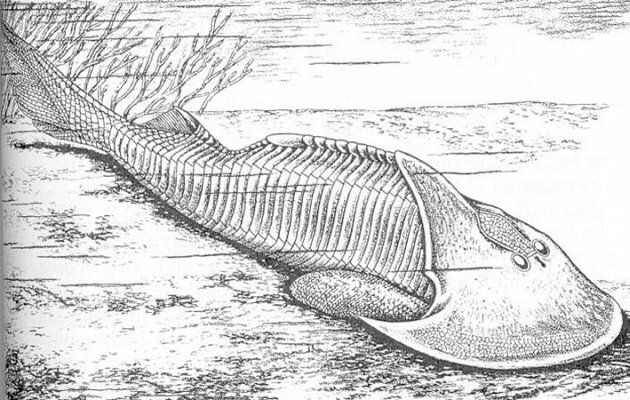 Some jawless fish still survive today. They are the lampreys and hagfish. Figure 01d is an artist's impression of the Cambrian scenery at the Burgess Shale halfway up Mt. Field, British Columbia. More than 120 different species of animal fossils have been found there. Some of those shown in the drawing are: sponges, cnidarians, worms, trilobites, anomalocaris, marrella, hallucigenia, sea scorpions, and brachiopods. 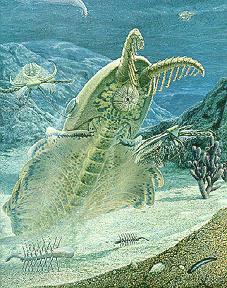 Jawless fishes were not shown there, they appeared only at the end of the Cambrian period about 510 MYA. Also not shown in the picture is the strange animal called opabinia. 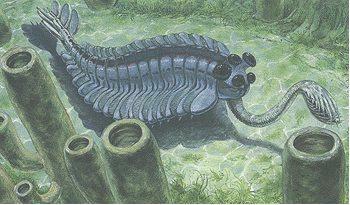 It is a predator of the Burgess Shale, measures three inches long. It has five eyes, gills all along its segmented body, and an efficient nozzle which vacuums prey for transfer to its mouth. definitely be assigned to well established taxa. They include virtually all the groups known from the Burgess Shale and other Middle Cambrian localities, thus compressing the available time for the morphological diversification of metazoans, known as the Cambrian Explosion, to just 10 Million years or so. These extraordinary fossil deposits, where organisms are so well preserved that even their soft parts remain as carbon films, are referred to as Lagerstätten, a German word that means "resting places", only recently borrowed by geologists. A lagerstatte is a spectacular rarity, and a few dozen of them are scattered through the Earth's geologic record like gems. together make evolution. But there are other causes for evolutionary change. 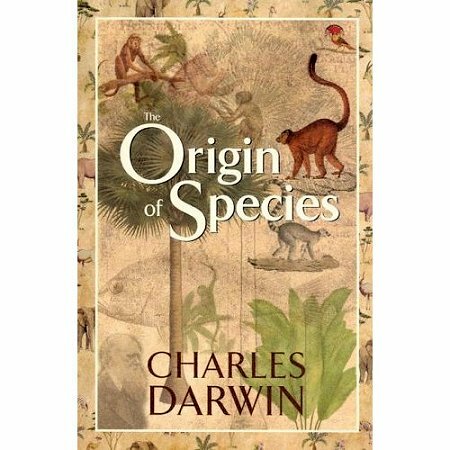 Darwin himself strongly emphasized the multifactorial nature of evolutionary change and warned against too exclusive a reliance on natural selection. Close examination of the history of life shows that the change is not necessarily progressive; it is certainly not predictable. The earth's creatures have evolved through a series of contingent and fortuitous events such as the Cambrian explosion and the mass extinctions, which imparts a quirky and unpredictable character to life's evolutionary pathway. 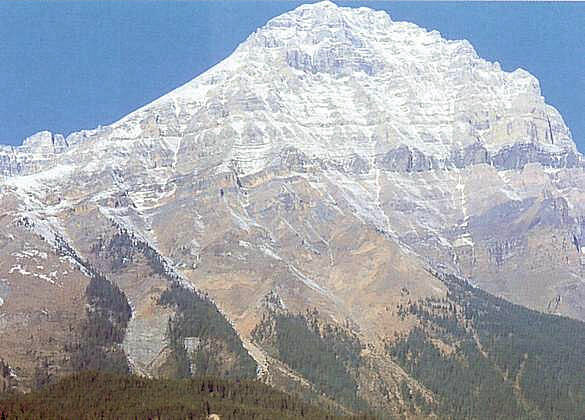 There is still much controversy over the significance of the Burgess and Chengjiang fossils. What is certain is that the transformation of life from single-celled organisms to multicellular organisms was swift, sudden and widespread. 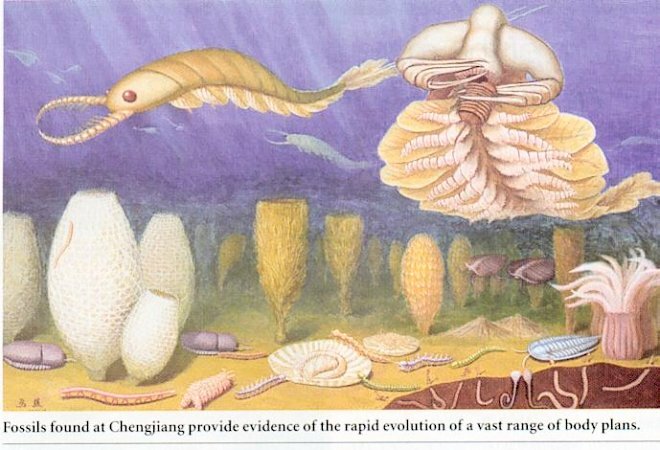 Another significant point is that if evolution was occurring at such a rapid rate, why are the Chengjiang fossils and the Burgess fossils so similar? During the 20 million year period between the two sites, evolution seems to have produced very little change. 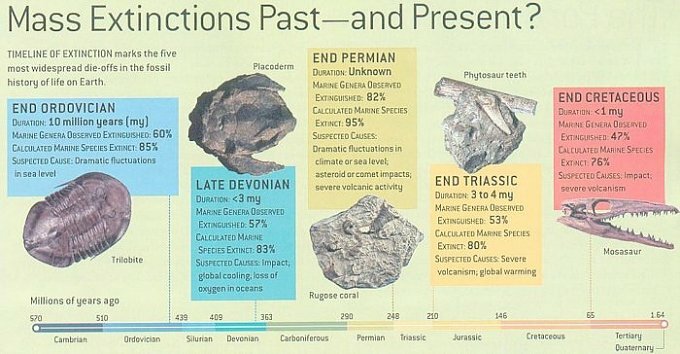 It seems that all of the diversity that was going to occur happened in a time period as short as 10 million years. Hardly an observation that supports a Darwinian view that life evolved by the slow accumulation of fortuitous mutations. Thus, there is suggestion that complex life came to earth (in the early Cambrian and probably Vendian) from elsewhere with many if not all of the biochemical processes in place. A possible fault with this kind of argument is the strong DNA linkage between the unicellular and mulitcellular organisms. It is highly improbable that the DNA structures of these organims are so closely related if the seed for multicellular organisms has another place of origin. Research in 2004 attributed the complexity of multicellular organism to the use of RNA based regulatory signals. The Cambrian explosion was related to the abrupt addition of this genetic regulatory system. 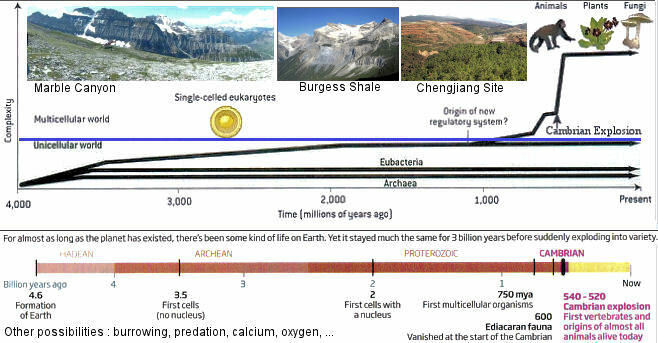 Figure 01g shows the complexity of eubacteria and archaea at low levels over the past billion years up to the present. While the complexity in eukeayote organisms advanced graudully up to a ceiling and then increased abruptly at the Cambrian explosion when a new regulatory system became available. (click here for detail). The proliferation of complex life forms some 20 million years prior to the Cambrian explosion might be just the initial trials to become multicellular. Burrowing - It is suggested that the genetic toolkit is only the necessary condition, the environment provides the sufficient condition in the form of burrowing deep down by animals. This kind of activity would bring oxygenated water down to the sediment opening up new and complex environment to make a living. 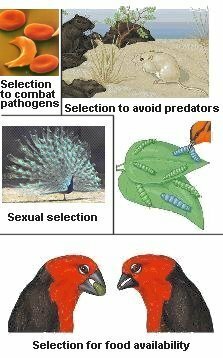 Predation - The arm race between predators and preys produced intense evolutionary pressures for the animals to become evermore innovative for the sake of survival. Fertillser - Rising sea levels during that period could have increased erosion, bringing nutrients such as calcium, phosphate and potassium into the oceans. It provided the ingredients to produce new forms in the arm race. 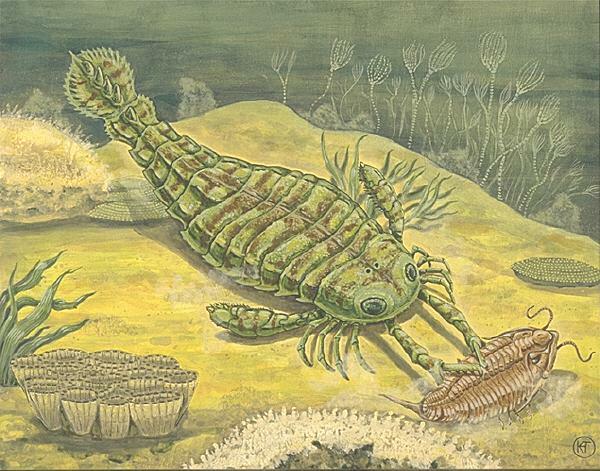 Oxygen - The level of oxygen had crept up gradually until it was sufficient to support the active lifestyle of advanced animals in the Cambrian period (Figure 01h). Added evidences for the Cambrian Explosion are now supplied by a very rich trough of fossils from Marble Canyon not far from the Burgess Shale. 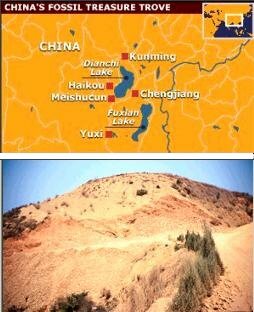 Together with China's Chengjiang fossil beds, the explosion seems to be worldwide (see insets in Figure 01g). There are many hypotheses as suggested above. It is increasingly clear that they worked together, but which one is the key ? It is reported in 2009 that rather than evolving during the Ediacaran period, the first multicellular animals evolved as early as 850 million years ago (Figure 01i), but remained on the fringes of life until ice ages changed the environment to be more favourable for them. 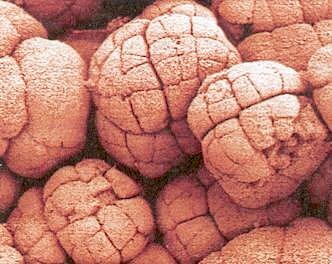 Embryo-like fossils for animals (could be sponges) preserved in seabed layers between 550 and 580 millions years old. Molecular fossils in the form of 24-isopropylcholestane (some kind of cholesterol in the cell membranes of certain sponges) were within oily sandstone 635 to 713 million years old. Massive reef of stromatolites was found in 850-million-year-old rocks. 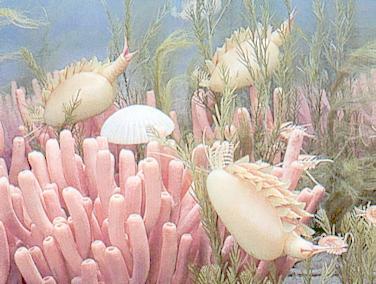 These early animals were restricted to live in a thin layer of surface water only where sufficient oxygen was available. 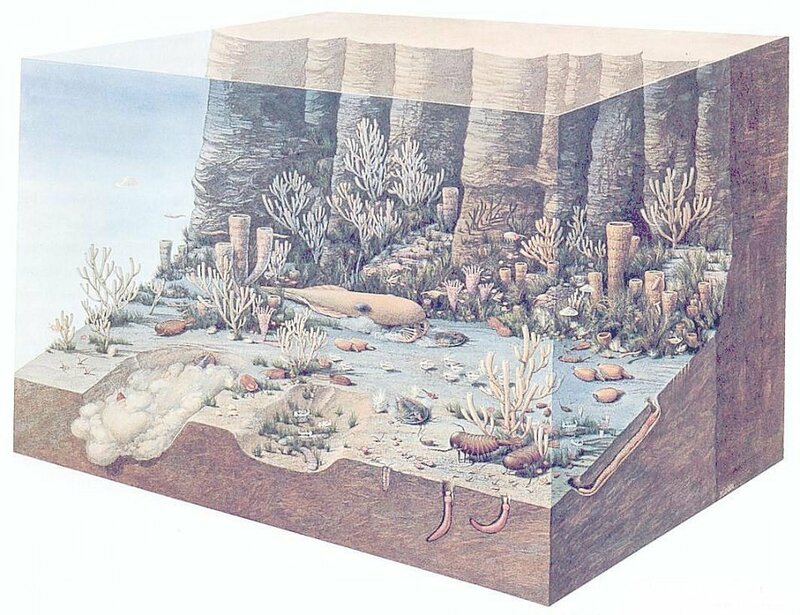 It was the series of deep ice ages that reset the chemistry of the oceans producing clear waters rich in oxygen in which larger, more complex animals could evolve - setting the stage for the Cambrian explosion. 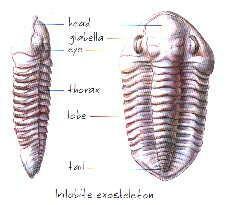 1It is believed that the group of animals called Chordata is the ancestor of all vertebrates. They don't have backbone, but have a fairly effective substitute in a structure occupying exactly the same postion, known as the notochord. There is a well-developed nerve cord running the length of the body above the notochord. The lancelet (amphioxus) is the present-day example. It is so common in the Amoy region of the Chinese coast that it is sold in bulk as food in the markets.